Reading doesn’t always have to be about a book and today I’d like to introduce you to a journal I was recently made aware of. I’d like to thank Jay Armstrong for sending me a copy. 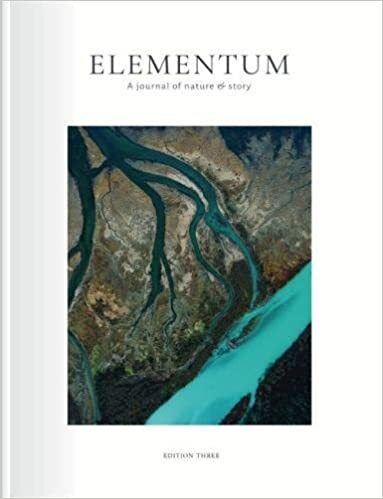 Elementum, as you may guess from the name, looks at our connection with the natural world through writing, illustrations and photographs. It is a stunningly gorgeous publication to look at and the writing inside is also beautiful and evocative, with this edition featuring work from Scots poet Kathleen Jamie, Man Booker longlisted author Wyl Menmuir and renowned nature writer Jim Crumley among others. Elementum is published twice a year and I have been reading the third edition, Roots, which was published last November. In this edition we travel to the islands of Haida Gwaii, thought to be where the first humans settled in what is now Canada, and we consider the species that once roamed our lands but now exist only in song, story or bone. We go deep underground, and into the ‘dark wilderness’ of caves, and we reflect on the complicated and elusive history of the Green Man. We consider the fragile ecologies of islands, join a poet and an artist in pursuit of the spirit of Edward Thomas, and tell the story of abandoned mines through extraordinary three-dimensional maps. These and other stories are accompanied by breathtaking images from printmakers, illustrators and photographers. With contributions from Kathleen Jamie, Jim Crumley and Wyl Menmuir, and featuring commissioned illustrations from Catherine Hyde and Jackie Morris. I was particularly taken with the article Illuminating Lost Words. I had heard the story on the radio a while back that some nature-related words once familiar to everyone, are becoming unknown to many children. There was quite an outcry when words such as bluebell, acorn, catkin and clover were left out of the Oxford Junior Dictionary in favour of words such as broadband, analogue and celebrity. As a family we have always spent a lot of time outdoors and teaching our children about the value of nature so I found this rather sad. Also included in this edition is a fascinating piece by Wyl Menmuir about caves and their place in folklore and literature, an article about conservation work in Mauritius by Colin Taylor, beautifully illustrated by Lucy Eldridge, an article about the history of ‘The Green Man’ by stonemason Alex Woodcock, accompanied by atmospheric photographs by Nicholas Hughes and a piece about the genetics and mythology of red hair by Catherine Mitchell. This latter article was something I was especially interested in having a red headed daughter! But there is so much more to discover and savour in Elementum and I urge you to get a copy and see for yourself. This sounds interesting – haven’t heard of it before! I hadn’t either but it really is a beautiful publication. It really is Mary, much more so than my little photos show.